In the Blood System unit we we learn about how our blood system provides a delivery and collection service for the whole body. The heart, blood and blood vessels make up a most efficient transport system that reaches all cells, bringing the substances they need and taking away their waste. You will also learn that humans and other mammals have what is known as a closed circulatory system with blood contained inside a network of arteries, veins and capillaries. The blood system continuously transports substances to cells and simultaneously collects waste products. Outline Galen’s description of blood flow in the body. Describe how Harvey was able to disprove Galen’s theory. State the function of arteries. Outline the role of elastic and muscle tissue in arteries. State the reason for toughness of artery walls. Very thick wall of smooth muscle tissue surrounding arteries makes them strong and elastic in nature with a narrow lumen (area where the blood flows). Elastin fibres store energy when they are stretched by the flow of blood. As they recoil the blood is further propelled through the artery. The thick smooth muscle layer in the arteries can be used to help regulate blood pressure by changing the diameter of the arteries. Describe the structure and function of the three layers of artery wall tissue. 6.2.U3 ​The muscle and elastic fibres assist in maintaining blood pressure between pump cycles. (Oxford Biology Course Companion page 292). Describe the mechanism used to maintain blood flow in arteries between heartbeats. Define systolic and diastolic blood pressure. When the ventricles of the heart contract (systole), the blood leaves the heart through the arteries at a very high pressure​. Describe the structure and function of capillaries. Describe the cause and effect of diffusion of blood plasma into and out of a capillary network. Capillaries have a very narrow diameter (10 µm) with thin surrounding endothelium cells to allow the shortest distance for O2 to diffuse into the blood from the alveoli in the lungs and from the blood into the body tissues. CO2 also can easily diffuse out of the blood into the alveoli in the lungs and from the tissue into the blood after respiration. Highly branched networks of capillaries increase the surface area, maximizing the amount of nutrients and gases that can move in and out of the capillaries. Because they are highly branched, the blood slows down to allow efficient transfer of O2 and CO2 into and out of the capillaries. Below are examples what capillaries look like. The pores or holes that allow certain substances to leave get larger from left to right, with Sinusoid capillaries having the largest openings. Specific names of these types of capillaries is not required. State the function of veins. Outline the roles of gravity and skeletal muscle pressure in maintaining flow of blood through a vein. Transport blood back to the heart from the capillary beds in tissues. Large lumen allows large amounts of blood to slowly return to the heart because the blood has to slow down as it passes through the capillary beds. 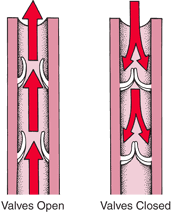 6.2.U6 ​Valves in veins and the heart ensure circulation of blood by preventing backflow. (Oxford Biology Course Companion page 294). Since the blood pressure in the veins is quite low because the blood slows down considerably when it reaches the capillary bed and there is not another pump like the heart to speed up the flow and increase the pressure, veins have a series of valves to prevent backflow. If the blood starts to flow backwards, it gets caught in the pocket valves causing that section of the vein to fill. When another contraction occurs and the blood starts to flow in the correct direction, the valves open allowing the blood to continue its movement towards the heart. 6.2.U7 ​There is a separate circulation for the lungs. (Oxford Biology Course Companion page 294). Draw a diagram to illustrate the double circulation system in mammals. Compare the circulation of blood in fish to that of mammals. Explain the flow of blood through the pulmonary and systemic circulations. Explain why the mammalian heart must function as a double pump. Humans and other mammals have a two different circulations of blood (blood is pumped twice). One circulation (systemic circulation) goes from the left ventricle to the rest of the body and back to the right atrium. The second circulation (pulmonary circulation) goes from the right ventricle to the lungs and returns to the left atrium of the heart. Blood flows from the right atrium into the right ventricle through the R.atrio-ventricular valve. The right atrium contracts right when the ventricle is almost full in order to push the rest of the blood into the ventricle. The right ventricle contracts sending the blood out of the ventricle (past a semi-lunar valve), through the pulmonary arteries to the lungs. The atrio-ventricular valve shuts preventing back flow into the atrium. 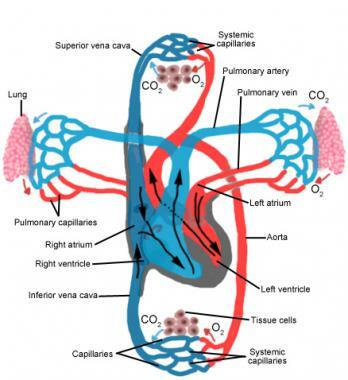 The blood flows through capillaries obtaining oxygen from the lungs and returning to the heart by the pulmonary veins; which empty into the left atrium. This blood is actually returning to the heart from the lungs at the same time as the blood that returns to the right atrium from the rest of the body. The blood then flows into the left ventricle through an L atrio-ventricular valve. The left ventricle contracts, sending the blood through another semi-lunar valve and out through the biggest artery in the body called the aorta. Again the atrio-ventricular valve shuts, preventing backflow into the atrium. Blood returns to the right atrium of the heart flowing from the inferior vena cava (blood from lower body) and the superior vena cava (blood coming upper body and head). Note: Both ventricles contract at the same time sending blood to the lungs and the other parts of the body. Outline the role of cells in the sinoatrial node. Within the wall of the right atrium are a specialised cluster of cardiomyocytes which direct the contraction of heart muscle tissue. Sinoatrial node initiates a heartbeat by contracting and sending out an electrical signal that spreads through the walls of the atria. Electrical signal can spread because there are connections between adjacent fibers across which allows for the signal to be spread. The spread of the electrical signal causes the left and right atria to contract. This second node – the atrioventricular node (AV node) – sends signals down the septum via a nerve bundle (Bundle of His). The Bundle of His innervates nerve fibres (Purkinje fibres) in the ventricular wall, causing ventricular contraction. This sequence of events ensures there is a delay between atrial and ventricular contractions, resulting in two heart sounds - Lub Dub. Outline the structures and functions of nervous tissue that can regulate heart rate. Describe factors that will increase heart rate. Describe factors that will decrease heart rate. ​While the basal heart rate is determined within the heart by the pacemaker, it can be regulated by external signals. The rate of the pacemaker can be affected by nerves connected to the medulla region of the brain. High blood pressure, low levels of CO2 (high pH) and high levels of oxygen, cause the heartrate to slow down. Cardiac nerves which are part of the sympathetic nervous system cause the heart rate to increase. The medulla of the brain controls most of the autonomic functions of the body such as breathing, heart rate and blood pressure. Outline conditions that will lead to epinephrine secretion. Explain the effect of epinephrine on heart rate. 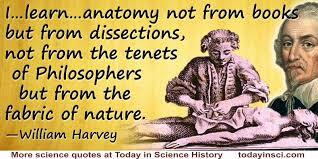 How the blood circulates around our body was discovered in the seventeenth century by a man named William Harvey. Click on the picture to get some background on Harvey. Describe the cause and consequence of atherosclerosis. Outline the effect of a coronary occlusion on heart function. AV valves close (because of the pressure) preventing backflow and the semi-lunar valves open. Explain the pressure changes in the left atrium, left ventricle and aorta during the cardiac cycle. Explain the relationship between atrial and ventricular pressure and the opening and closing of heart valves. Explain the atrial, ventricular and arterial pressure changes as illustrated on a graph of pressure changes during the cardiac cycle. Identify the time of opening and closing of heart valves on a graph o f pressure changes during the cardiac cycle. The blood clot formed is called a thrombus and an embolus if it breaks free to travel through the bloodstream. 6.2.S1 ​Identification of blood vessels as arteries, capillaries or veins from the structure of their walls. (Oxford Biology Course Companion page 294). Compare the diameter, relative wall thickness, lumen diameter, number of wall layers, abundance of muscle and elastic fibres and presence of valves in arteries, capillaries and veins. Given a micrograph, identify a blood vessel as an artery, capillary or vein. Label a diagram of the heart with the following structure names: superior vena cava, inferior vena cava, pulmonary semilunar valve, aorta, pulmonary artery, pulmonary veins, aortic semilunar valve, left atrioventricular valve, left ventricle, septum, right ventricle, left atrium, right atrium and right atrioventricular valve. Can you explain why the flow of blood around the body is known as a double circulation? But does a heart actually need to ‘beat’? Well yes, if it is living. But not this rotor-based artificial heart. Why not have a go at open heart surgery from abc.net. Our current understanding is that emotions are the product of activity in the brain rather than the heart. Is knowledge based on science more valid than knowledge based on intuition? ​Hank takes us on a trip around the body - we follow the circulatory and respiratory systems as they deliver oxygen and remove carbon dioxide from cells, and help make it possible for our bodies to function. 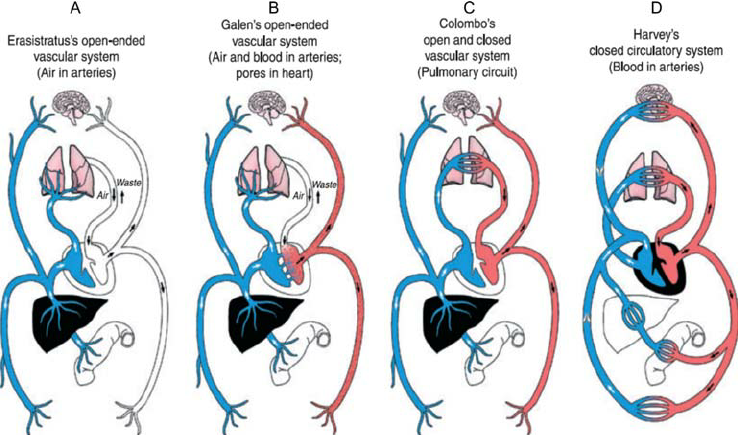 ​Paul Andersen surveys the circulatory system in humans. He begins with a short discussion of open and closed circulatory systems and 2,3, and 4-chambered hearts. He describes the movement of blood through the human heart and the blood vessels. He discusses the major components of blood and the cause of a heart attack. ​Hemophilia - Watch this digital animation, specifically developed by biotherapeutics leader CSL Behring for kids and/or caregivers of newly diagnosed patients with hemophilia A or hemophilia B, to learn more.